Fairhurst were commissioned by Northumberland Estates to provide Landscape Architecture services for a proposed mixed use development at Scaffold Hill and an extension to Rising Sun Country Park in North Tyneside. Proposals for the site include the development of 450 residential units, a community hub providing both retail and health services, community allotments, associated infrastructure and environmental enhancements. Fairhurst’s landscape architects undertook a landscape and visual appraisal to determine likely impacts resulting from the proposed development. This characterised the landscape design proposals, which include landscape masterplans for the residential and country park areas, environmental mitigation / habitat management plans, and landscape character area details. The landscape design is sensitive to existing landscape character and as a result, high quality design and mitigation is provided for the proposed development. 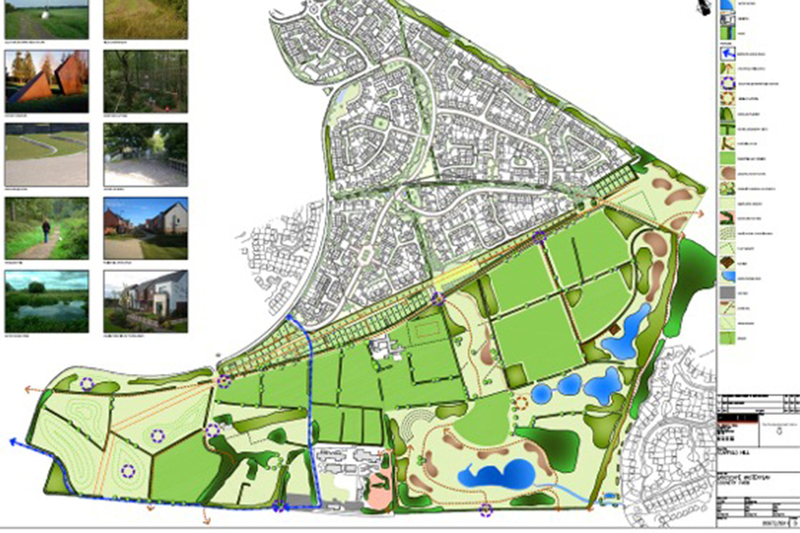 The proposals create enhanced routes and green spaces linking to the country park, retaining existing valuable features such as mature hedgerow boundaries, seasonal wetland habitats and ponds to protect designated wildlife corridors within the site. Fairhurst were subsequently instructed to act as Expert Witness on behalf of The Northumberland Estates as part of an appeal against refusal of planning permission and Public Inquiry. This has involved preparation of supporting information such as an Open Space Assessment.